. 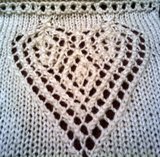 Knit So Simple: how do i love thee? let me count the ways . . .
for the last 27 days we've celebrated the uniqueness of this month with all things heart related . . from bibs to book marks, but if truth be told, the guys in your life probably aren't the greatest fan of a delicate little cotton heart to sit their cup of coffee on! and despite the fact that it's February and 70+ degrees even as i'm writing this morning, i still want the guys in my life to know how much they mean to me . . so perhaps my knitting should be more about planning and thinking ahead and working on projects that i can stash and store for birthdays and Christmas ... what guy doesn't want a hat or 2 to grab and go ... they seem to be rather popular at school right now . . so i've found a few really great "GUY SITES" for options to consider knitting between now and the end of the year, in their favorite colors, just so they too will have a piece of my heart . . . always! 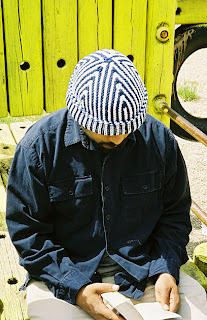 This Brooklyn Tweed option is a simple and easy pattern to follow and looks just like the ones that all the guys are wearing around the school .... the 'beanie' style that is close fitting and that does not have a folded up cuff. And while stripes are certainly a fun 'option', they are just that - - optionAL!!! if you have a friend who's more RETRO in their fashion statement, then this hat would be a fun, but current, throw back for them! 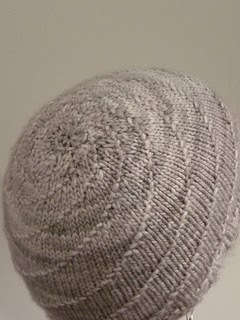 Using Worsted Weight yarn, it would work up rather quickly . . and you could certainly bypass the crochet provisional cast on .... but .. you've got time to learn something new, so why not give it a try . . . and also get ready for the things we'll learn in June (as far as crocheting goes!) This is a great, heavy duty, lined pattern that really is WORTH the extra effort. The tutorials and pictures make it a simple, easy to follow, process . . . Go for it! Call is a resume builder! i LOVE this option for something a bit different! at the moment i can't think of who would wear the striped version, per se, but how cool would this one work up in a solid color even! 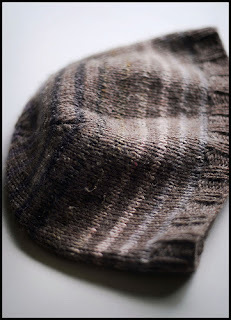 it would have an interesting TEXTURE that would distinguish from just another generic off-the-rack hat! and what about THIS one ???? i LOVE the motion that is created by a simple math equation . . it's almost like the mistake . . that ISN'T !!! 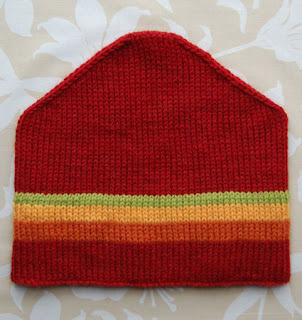 i just want to stay home and knit hats all day today! (cough, cough, sneeze, sneeze!) . . . please? if you do the math on any of the above samples, you will see that you cast on, on average, 80ish stitches and knit a minimum of 5" before starting your decreasing. So, how about THIS for a valentine measurement? How do i love thee? Two Thousand Eight Hundred Stitches worth minimum! Not that you can equate your love with stitches BUT . . . with a 16" circular needle you sure can make someone smile each and every time they snug that hand-made gift of love on their sweet little head ... and as they stuff it back into their pocket when inside they will be reminded of how their significance to you in each and every stitch that was wrapped around your needles - - the yarn you chose with them in mind - - the love you knit into each stitch! They will KNOW that they are your valentine - - as plain as the nose on their face . . or the cap in their backpack! 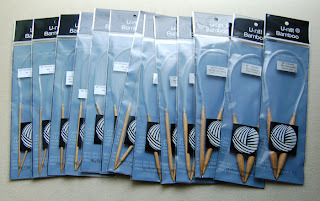 since it's pay day today i'll do a quick 'commercial' for some of my favorite needles to help expedite this Valentine hat project along . . i LOVE the patina finish on these U-nitt bamboo needles ... i have them in regular, circular AND double points .. and would recommend you adding them to your stash as well ... they are available on E-bay and you can get an entire SET of circulars for under $20! Sizes 1 - 15 .... for LESS than $20 .... free shipping! 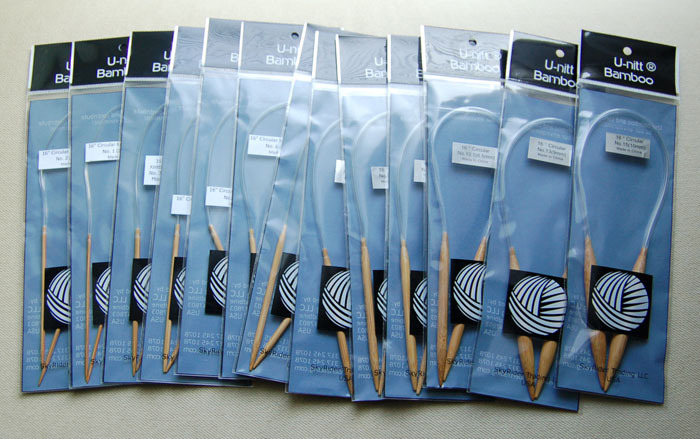 They are smooth and feel great in your hands .. the tips are not so pointy that they split your yarn . . . i really can't say enough good about them but highly recommend them to you . . and please don't be afraid of the double points ... they are a great addition to your knitting collection . . and if you chicken out once they arrive, they also make great holders for your hair if you are having one of "those" days and just need to get it up and out of your face! This month of Love has provided me with plenty of time to think about the blessings i have been given, in the way of both family and friends . . and has made me realize how often i take for granted my motives and methods . . if i've knit something for you then surely you KNOW that i love you .. and thus, i may not have actually TOLD you . . but honestly! who in their right, and honest, mind does not like to HEAR such a verbal affirmation and commitment! Those 3 simple words, that mean so very much to each of us . . i LOVE YOU!!!! and then the sweetest of all sounds . . the hear your own name at the end of that declaration . . i know how much i long to hear that from my heavenly Father . . to know that i am Loved and Accepted ... Forgiven and Redeemed . . the know that His Sacrificial gift of His Son so that i too can be adopted into His family ... makes EVERY day Valentine's Day for me ... and i long to live a life that pleases Him and honors Him with my faithful and obedient walk . . to show Him how much i love Him ... not only by what i do . . but by what i say as i a sit and knit and praise Him for all that He has done for me!